From quite humble beginnings in post-war Greece to one of Australia’s most respected property developers and businessmen, Gerry Karidis’ story is unlike any other. Mr Gerry Karidis AM is founder of the family-owned and operated Karidis Corporation Limited. Under his strong leadership, the company has pushed the boundaries and set new benchmarks for more than 50 years, and is today one of the largest and most dynamic developers, with landmark locations across South Australia and Victoria. Mr Karidis first immigrated to Australia as a 19-year old, settling in Adelaide and working in a range of employment, including casual labourer, a dock worker and on a production line for a car manufacturer. After running several small businesses and managing minor property renovations and construction projects, he obtained his Land Salesman Licence and became a medium sized developer specialising in Adelaide’s western suburbs. In 1975 he formally established Karidis Corporation Limited, and at a time when a national economic crisis had brought the building industry to a standstill, he was still building an average of one house every day. Over the years following, Mr Karidis not only delivered a number of flats, townhouses and units across the metropolitan area, he also developed a number of landmark buildings, pioneered a standard design template adaptable to varying land sizes and introduced the concept of selling off the plan to investors. Following on from this, he broadened his focus to include city residential developments and a number of major non-residential ventures. In addition to running his own business, Mr Karidis served a 7-year term on the Housing Trust Board of South Australia. Other community contributions have included being a Board Member and Chairman for the South West Community Hospital, Board Member with the War Memorial Trust, Member of the Rotary Club of Thebarton, the Housing Industry Association, Property Council of South Australia, Adelaide City Living Advisory Group and the Adelaide Infrastructure Investment Forum. On 11 July 1990 he was awarded the Member of the Order of Australia in recognition of his ‘service to the building and construction industry and for service to the Greek community’, and in 1997 the then Premier of South Australia, the Hon. John Olsen, presented Mr Karidis with a medallion in recognition of his outstanding contribution to the building industry in South Australia. A second medallion was presented in 2000 for his continuing work for the industry. 2013 saw Mr Karidis honoured as the inaugural Property Icon by the Property Council of Australia in recognition of his efforts to change the face of South Australia, reinvigorating many quadrants of the city and metropolitan areas, and for making an outstanding contribution to the industry and local community. 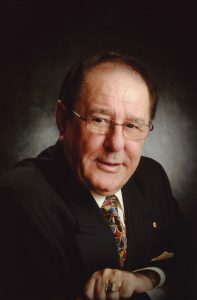 His ingenious and enterprising character continues to contribute to South Australia’s business and social landscape, and he remains committed to creating jobs and wealth within the community, advocating for affordable housing options, and increased migration to address South Australia’s ageing population and declining numbers.